Fear begins to trump logic. Specters of the assault call for them during the jungle nights. The escape mission descends in to mutiny as they discover an unknown threat unlike the Viet Cong hunts them from within the primitive environment. 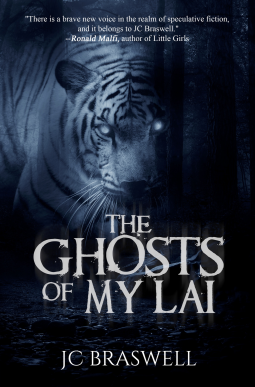 Williams soon realizes that survival is not possible without first confronting the ghosts of My Lai…and the sins of their past. An overactive imagination. I’ve been writing short stories since I was in elementary school, sometimes to the detriment of my grades. I can’t tell you how often my teachers caught me daydreaming. Then I started drafting novels back in law school. It wasn’t until ten years ago when I started taking it seriously. Seventeen novels later and I don’t intend to look back. Then there’s also the power of the written word. With writing you can convey a message without beating someone over the head with it. There’s a reason why the classics stick out. If I’m being honest, I don’t consider myself an author. Am I published? To a point, but I don’t have the “street creds” yet to consider myself an author. My reader base is extremely small, and I only have three full-length novels and a short story out there. I think I’m more like writer, you know? It has nothing to do with being validated by big publishers. The publishing industry is in such a state of flux with e-books, self-pubbed authors, and the, well, we’ll call it the mentality of the decision makers. You have a flood of liberal arts majors acting as barriers to writers. Most come across as political zealots who can’t see the forest through the trees they want to plant. I’ve read several interviews by agents, etc. The whole “need diverse writers/books” is a joke. At some point I hope I’m validated as an author, but I don’t know when that is. I would hate for 2 million words to go to waste. I’m not that important to think that I can influence a reader into taking away a certain message, but I hope at some point I do. Most of my novels are about self-discovery, the gray areas of human nature, faith, and redemption. I make no bones about my subtle messages in my books. My Lai is a perfect example of my writing. You have a protagonist who battles his internal guilt while trying to hold a small band of soldiers together. Most of us deal with stressful on a daily basis. We try to hold our families together while dealing with internal strife. It also makes us grow as individuals, at least those of us who don’t take the easy way out. Unfortunately, modern society says a pill can solve everything. Our culture has climbed mountains of adversity without the help of pills in the past. I also find it quite troubling that media romanticizes terrible outcomes, including suicide. Terrible, just terrible. It certainly isn’t the money. Readers who ask questions about the characters I write, especially those characters whose fate remain uncertain. It’s pretty cool to see someone really like my books. It really is. Loneliness until the characters take over. Sometimes it’s difficult. I’m not going to lie, sometimes the minute details of grammar is a pain. Be prepared for rejection. Be prepared for disappointment. Be prepared for questioning whether you’re wasting your time. Be prepared to quit a million times. Also, don’t get into it for the fame or the money. Go into computer programming for that. Email me at jc@jcbrasewell. That’s the easiest way. My website is www.jcbraswell.com. All of my other contact information is there. would only cause more panic in the group. only one answer right now,” Donovan said, resting back on his elbows. say that,” Harris’s voice cracked. before wiping it across his thigh. boss.” McEvoy squirmed as the rock plunked him on the shoulder. could only be getting worse. Harris, with his naïve youthfulness, held on to a simple hope. line pulled as a fish splashed on the surface. It was only a pipedream. miracle that would not happen. worked out for anyone with experience in electronics. along the ground to the beat of whatever Doors song played in his head. McEvoy adjusted the knob until a muffled song broke through the static. Jackson asked, leaning in as if he could listen better. know.” McEvoy honed in on the signal until a distinct muffled chant emerged. the unknown words captivated them. grew more distinct with little melody to the deliberate words. have some weird tastes,” Jackson said. any of this?” Williams looked at McEvoy. old. An older dialect.” McEvoy shrugged. them rustled as a stiff breeze suddenly rolled across their makeshift camp. right. None of this is right.” Harris withdrew from the contraption. The radio shuddered with the strength of the signal. Turn it off,” Garcia demanded. McEvoy twisted the dials, but the radio refused to obey. his head in concert with the chanting as it came to an abrupt halt. said, blowing on his finger. Garcia muttered in a voice low enough for only Williams to hear. A fan of Lewis, Hemingway and Tolkien, author JC Braswell writes in a few different genres including Thriller, Horror, Sci-Fi, and Young Adult. In addition to writing JC is a practicing attorney specializing in estate planning and corporate law, he is the recipient of the American Health Lawyers Association award for his legal writing. JC makes his home along the Chesapeake Bay with his wife and two children.